Trees increase incredible beauty to properties, but just for a certain period. Remember, a tree’s usefulness or lifetime is restricted because of various factors. While eliminating tree roots from your lawn makes it easy to clean your yard, the stumps can be annoying, particularly when tending the yard. Although it’s possible to attempt DIY removal, beware that this option comes with various risks. Therefore, it’s imperative you hire a tree service to avoid unnecessary costs and inconveniences. Fortunately, our Orlando tree service has the tools to tackle any type of tree service from eliminating diseased branches to tree stumps. If you’re still unsure about hiring a professional cutting service, check out why you should hire us. There’s no tree that’s too awkward or big to handle for our highly skilled and certified arborists. We aren’t just precise. We offer fast and efficient services through our bucket trucks, which allow us to reach the precise spot without taking the time to shift everything out of the way. We have a massive crane, so we’ll remove the entire tree and remnants in no time. Personal safety is among the most significant reasons to consider a professional cutting service. While it’s vital to guard your property, it’s even more crucial to protect yourself. Bear in mind that falling branches, equipment malfunction, and power-lines are some of the risk factors associated with tree removal. These factors can lead to lacerations or even death and the last thing you want is to move from considering the expense of tree removal to considering the medical costs. To avoid unnecessary expenses, you can simply count on our trained professionals who have broad safety equipment. Remember, the likelihood of falling trees is common after severe winter storms or rain. After all, weather damage results in weakened trees and as a result increase the likelihood of toppled trunks or falling branches. In these situations, tree removal is necessary for safety purposes. We advise property owners to conduct tree inspection following severe storms. Simultaneously, we recommend you keep a keen eye for broken and cracked branches as well as root and trunk damage. Beware that heavy winds could topple your tree at the base, so ensure your trees maintain stability to prevent this serious risk. Don’t try removing a fallen tree on your own because even small ones need expert skills and special training. Some homeowners conduct this task by watching via YouTube, and this is unlikely to end well. Beware of the various risks linked to falling branches and trees, which can destroy cars, roofs, and other personal property. In the event that you’re having it removed because of the risk, it poses to your property already, you’ll only increase this risk if a professional company doesn’t conduct the service. In the event that a professional service causes property damage, they have extensive insurance coverage-something you won’t necessarily need if you hire a company. When you hire our company, you’re assured that we’ll take care of the tree in an efficient manner, possibly preventing additional damage to your property. A professional removal service has the suitable equipment to eliminate the cut tree. You don’t have to worry about securing a rental wood chipper, establishing how to use it, and ensuring it’s in pristine condition when you return it. Even if you’re confident of cutting the tree safely, you might not know what to do once it’s cut. Fortunately, our removal service has a plan before we begin. If you’re planning an outdoor project, for instance, the inclusion of a fence or patio, such major renovations may need tree removal. Remember that a qualified company may assist with overall renovation planning, enabling the smooth flow of the project. Chainsaws, safety gear, and the rental fee for the stump grinder and the other accessories you’ll require to cut the tree by yourself are very expensive. Beware that you’ll end up spending more on the equipment than on an expert service and you’ll need to do everything yourself. 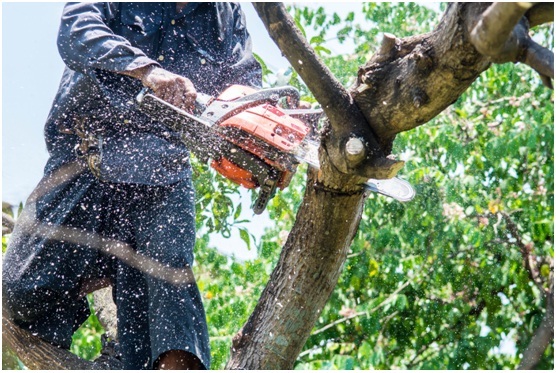 When it comes to tree removal, you must hire a professional service if you want to avoid the inconveniences and drawbacks that could emerge if you do it on your own.